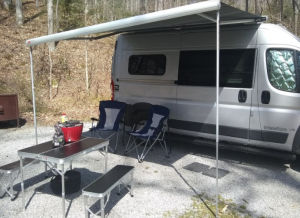 This is a 2015 Dodge Ram Promaster custom camper van rental from 828CamperVanRental.com. The Ram Promaster features plenty of head room as well as the towing capacity to haul whatever gear you may need. . . read more below or Book Now! This campervan is a class B vehicle. It includes banquet seating that converts to a bed platform, a removable and adjustable table seating 4, a full galley kitchen, roof racks and ventilation. 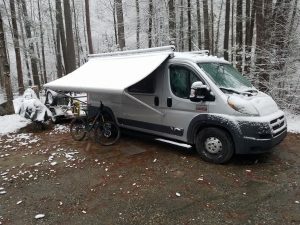 There are add-on features available including mountain bikes, motorcycles, camping gear and the trailer to carry it all. When converted for night time the van will sleep four comfortably. The interior is styled after the European campervan experience with solar/electric/single fuel source reliability and freedom from the grid. The overall length is 17″ but it handles like a much smaller vehicle and does include back-up cameras just in case. Also available with rental are road side assistance and insurance. Roadside assistance includes help with breakdowns and financial protection from such occurrences. Vehicle insurance covers liability and damages up to $1 million for qualified clientele. Add on’s are also available. 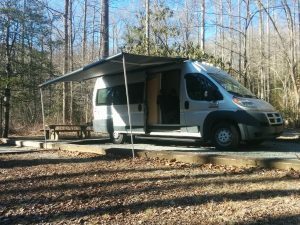 This is the 2015 Custom Camper located in Mills River, NC, just south of Asheville.